March | 2008 | KBK Bakery's Adventures in Baking! Well, those of us at KBK BAkery just didn’t think one cake was enough, soo… we made 3! Since Easter was this month we opted to make cakes to take to Easter, and since we are just friends, and not related (pity that it is) that meant multiple cakes. Luckily, as will all Dorie recipes (goddess that she is), the cake came together flawlessly so making 3 was not a chore. 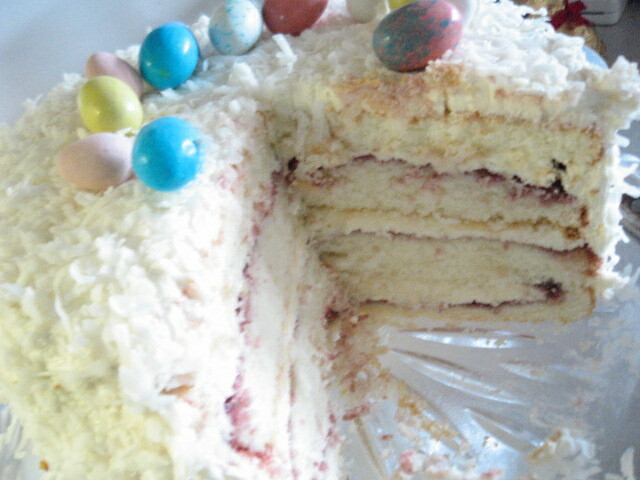 We all went for the classic white with lemon zest for the cake, but the fillings and icings are all a little different. The first cake was for Beth’s family. She chose strawberry preserves for her cake. 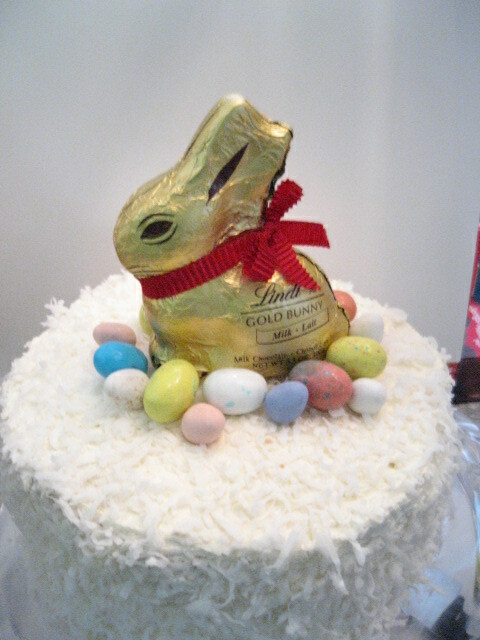 To add a little extra Easter feel, she also added a touch of pink food coloring to her buttercream. Very cute! The pink is a little hard to see in the photo, but it was a very Easter appropriate baby pink! The second cake was for my husband’s side of the family. For their cake, I went with raspberry seedless (i love that it exists!) jam and I went with a marshmallow frosting. Marshmallow just seems to go with Easter… maybe it’s all those Russell Stover marshmallow eggs I ate growing up? The last cake I made for my parents’ house. Both my mother and father are diabetic, so I wanted to try my hand at a sugar free version. And with the exception of the fact that the cake didn’t rise at all the cake came out very well. My parents enjoyed it very much and my dad had fun taunting his coworkers with the leftovers at work on Monday, heh. The filling was sugar free raspberry, and the icing was buttercream made with Splenda, so the only sugar in the cake was the lemon juice and the coconut on the outside. It was, by no means, fat free, heh, but pretty darn close to sugar free! 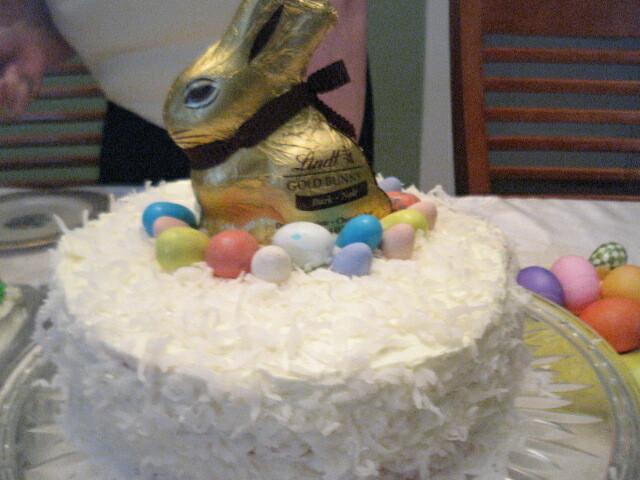 I used the bunnies to tell the cakes apart. The sugar version had a red ribbon and the sugar free had a brown ribbon! Thank goodness for color coded rabbits! Centre a rack in the oven and preheat the oven to 350°F. Butter two 9 x 2 inch round cake pans and line the bottom of each pan with a round of buttered parchment or wax paper. Put the pans on a baking sheet. Add the butter and working with the paddle or whisk attachment, or with a hand mixer, beat at medium speed for a full 3 minutes, until the butter and sugar are very light. Beat in the extract, then add one third of the flour mixture, still beating on medium speed. Beat in half of the milk-egg mixture, and then beat in half of the remaining dry ingredients until incorporated. Add the rest of the milk and eggs beating until the batter is homogeneous, then add the last of the dry ingredients. Finally, give the batter a good 2- minute beating to ensure that it is thoroughly mixed and well aerated. Transfer the cakes to cooling racks and cool for about 5 minutes, then run a knife around the sides of the cakes, unfold them and peel off the paper liners. Invert and cool to room temperature, right side up (the cooled cake layers can be wrapped airtight and stored at room temperature overnight or frozen for up to two months). Put the sugar and egg whites in a mixer bowl or another large heatproof bowl, fit the bowl over a plan of simmering water and whisk constantly, keeping the mixture over the heat, until it feels hot to the touch, about 3 minutes. The sugar should be dissolved, and the mixture will look like shiny marshmallow cream. Remove the bowl from the heat. Working with the whisk attachment or with a hand mixer, beat the meringue on medium speed until it is cool, about 5 minutes. Switch to the paddle attachment if you have one, and add the butter a stick at a time, beating until smooth. Once all the butter is in, beat in the buttercream on medium-high speed until it is thick and very smooth, 6-10 minutes. During this time the buttercream may curdle or separate – just keep beating and it will come together again. On medium speed, gradually beat in the lemon juice, waiting until each addition is absorbed before adding more, and then the vanilla. You should have a shiny smooth, velvety, pristine white buttercream. Press a piece of plastic against the surface of the buttercream and set aside briefly. Put one layer cut side up on a cardboard cake round or a cake plate protected by strips of wax or parchment paper. Spread it with one third of the preserves. Cover the jam evenly with about one quarter of the buttercream. Top with another layer, spread with preserves and buttercream and then do the same with a third layer (you’ll have used all the jam and have buttercream leftover). Place the last layer, cut side down, on top of the cake and use the remaining buttercream to frost the sides and top. 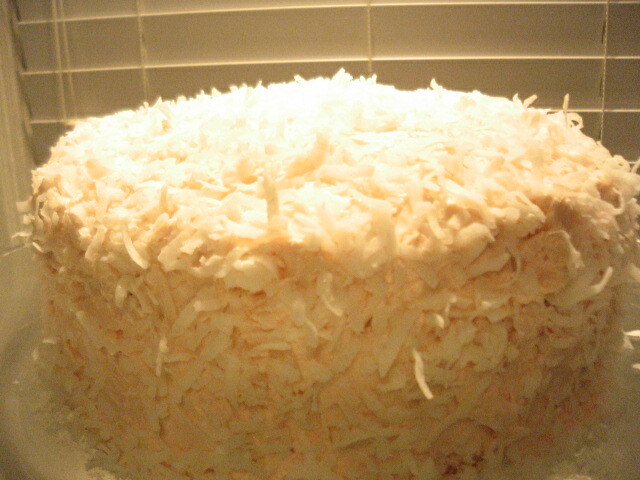 Press the coconut into the frosting, patting it gently all over the sides and top. The cake is best the day it is made, but you can refrigerate it, well covered, for up to two days. Bring it to room temperature before serving. If you want to freeze the cake, slide it into the freezer to set, and then wrap it really well – it will keep for up to 2 months in the freezer; defrost it, still wrapped overnight in the refrigerator. 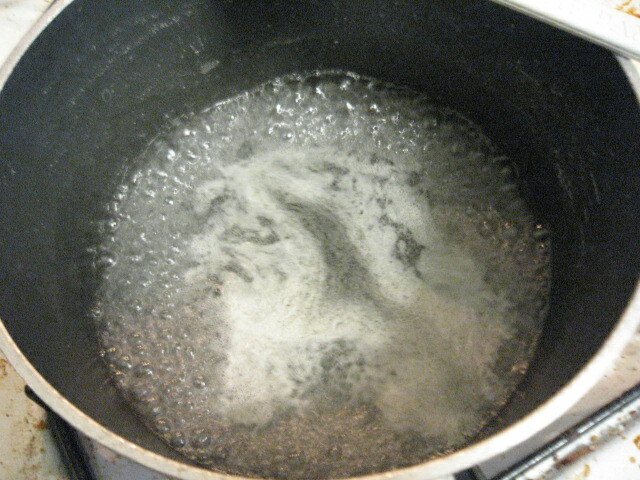 Beat in one-fourth of the sugar until fluffy, and then repeat with the remaining sugar. Beat in the vanilla, and then stir in the marshmallow cream until well blended. Finally! A Tuesdays With Dorie post! Phew! Didn’t know if I’d ever get the hang of it! This week was Caramel Topped Flan! It was so easy! I didn’t even need a mixer, so cleanup was lovely. The caramel came together very well. I ended up needing a bigger pan to float my flan. The cake pan I used was a 9″ rather than an 8″ so it wouldn’t fit in my 9×13. That’s ok, though, I just put it in my 1/2 sheet cake pan. It all worked out in the end! The texture is wonderful. It’s so smooth and creamy. I think it could have stood a little longer in the oven for the custard, but the caramel came out very well. It tastes almost like there is alcohol in the caramel, but there isn’t. Maybe it’s from the vanilla in the custard? Who knows. 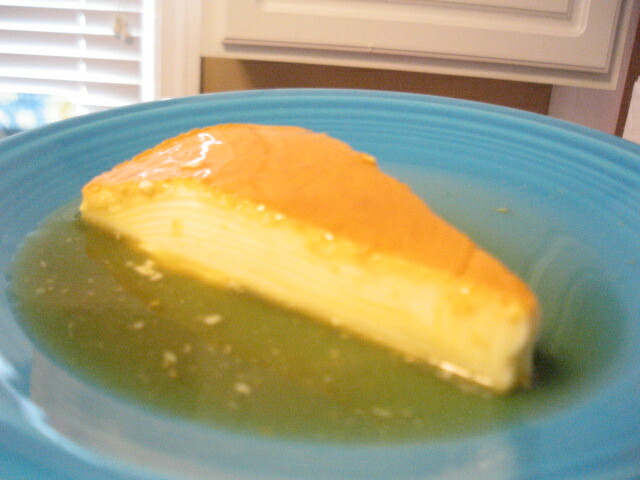 It tastes like the flan I’ve had out at restaurants, but with a finer texture, so I guess I did it right. It turned out a little shorter than I would have like, but that is probably due to the larger pan. Oh well! As long as it tastes good, right?!? Getting Ready: Center a rack in the oven and preheat the oven to 350°F. Line a roasting pan or a 9-x-13-inch baking pan with a double thickness of paper towels. Fill a tea kettle with water and put it on to boil; when the water boils, turn off the heat. Put a metal 8-x-2-inch round cake pan-not a nonstick one-in the oven to heat while you prepare the caramel. 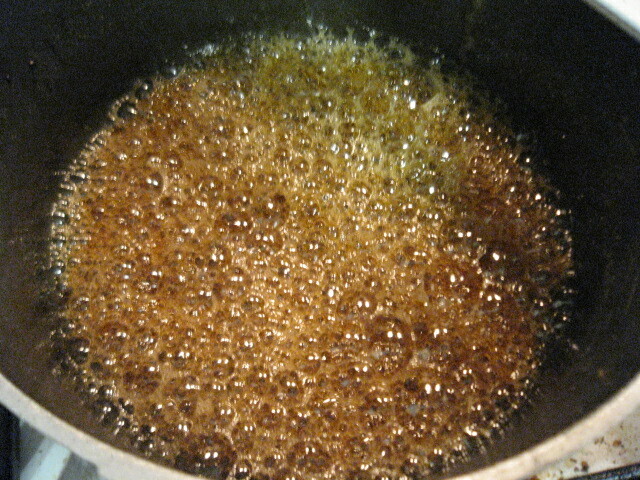 To Make the Caramel: Stir the sugar, water and lemon juice together in a small heavy-bottomed saucepan. 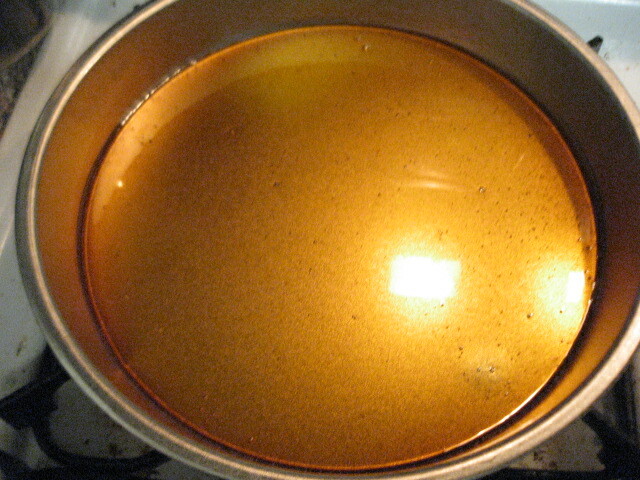 Put the pan over medium-high heat and cook until the sugar becomes an amber-colored caramel, about 5 minutes-remove the pan from the heat at the first whiff of smoke. Remove the cake pan from the oven and, working with oven mitts, pour the caramel into the pan and immediately tilt the pan to spread the caramel evenly over the bottom; set the pan aside. To Make the Flan: Bring the cream and milk just to a boil. Meanwhile, in a 2-quart glass measuring cup or in a bowl, whisk together the eggs, yolks and sugar. Whisk vigorously for a minute or two, and then stir in the vanilla. 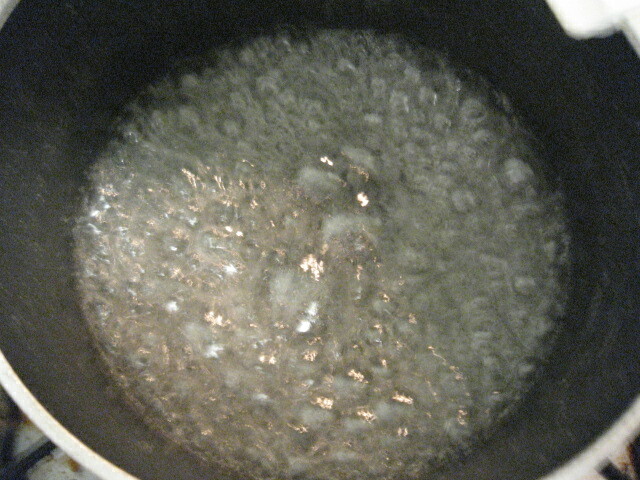 Still whisking, drizzle in about one quarter of the hot liquid-this will temper, or warm, the eggs so they won’t curdle. Whisking all the while, slowly pour in the remainder of the hot cream and milk. Using a large spoon, skim off the bubbles and foam that you worked up. Put the caramel-lined cake pan in the roasting pan. 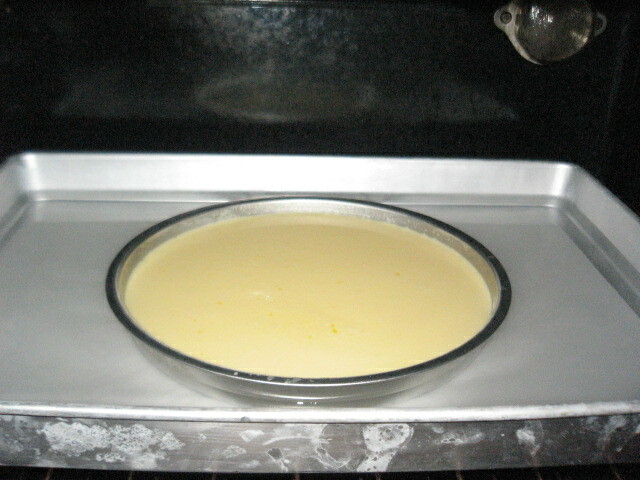 Pour the custard into the cake pan and slide the setup into the oven. Very carefully pour enough hot water from the kettle into the roasting pan to come halfway up the sides of the cake pan. (Don’t worry if this sets the cake pan afloat.) Bake the flan for about 35 minutes or until the top puffs a bit and is golden here and there. 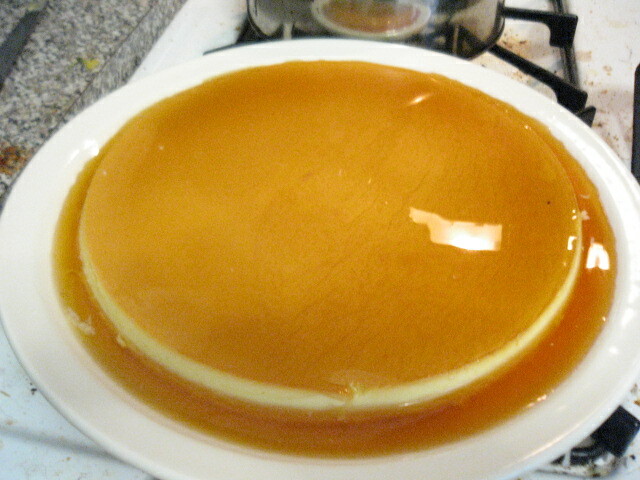 A knife inserted into the center of the flan should come out clean. Remove the roasting pan from the oven, transfer the cake pan to a cooking rack and run a knife between the flan and the sides of the pan to loosen it. Let the flan cool to room temperature on the rack, then loosely cover and refrigerate for at least 4 hours. When ready to serve, once more, run a knife between the flan and the pan. Choose a rimmed serving platter, place the platter over the cake pan, quickly flip the platter and pan over and remove the cake pan-the flan will shimmy out and the caramel sauce will coat the custard. Ok. You say “marshmallow” and the first thing I think of is “S’mores”, so it’s only fitting that I make a S’mores cupcake. I’m sure it’s not a terribly new idea, but boy is it tasty! Nothing brings of memories of Girl Scout camping trips like the smell of a perfectly toasted marshmallow. And I like mine a golden brown color, here, folks. None of this “set it on fire, blow it out and call its charred remains toasted” nonsense. If I wanted to eat charcoal, I’d lick one of the logs. Roasting the perfect marshmallow takes time. Patience. The willingness to be a human rotisserie… but thankfully, little culinary torches are readily available and your local hardware or cooking store. So, my cupcakes are nicely toasted and I didn’t even have to build a bonfire in my backyard. A fact that I’m sure would please my neighbors and the fire department very much if they knew of their good fortune. Especially since my hubby is a bit of a pyro. Burnt off all his arm hair once because he put gasoline on a fire before he lit it *to get it going faster*. The ensuing fireball was quite spectacular. Luckily only his arm hair was affected. Untold amounts of mocking pleasure for all those present, however. To which he replies, “yeah, but it got it started, didn’t it?” He’s so special. Press into the bottom of the baking cups. Sift flour, baking soda, baking powder and salt together in a bowl. In medum heat-proof bowl over simmering water, melt chocolate in water, stirring occasionally until smooth and remove from heat. In a large mixing bowl, beat butter on medium until creamy. Continue beating while sprinkling in granulated and brown sugars, 1 tbs. at a time. Add vanilla and beat until very light. Add eggs, one at a time, beating until thoroughly blended after each, then beat until very light and creamy. Add flour in 3 parts alternating with 2 parts of buttermilk. Beat on lowest speed until each addition disappears. Fill each cupcake cup ½ way and bake at 350°F until a toothpick comes out clean or the cake springs back when pressed lightly. Approximately 20 minutes. Top each cupcake with the marshmallow frosting and roast to the desired toasty-ness. Sprinkle toasted cupcake with a pinch of graham cracker crumbs. This cupcake creation was inspired by the movie Waitress. I love pies and was so terribly disappointed that they did not include recipes on the DVD for that movie! They have such wonderful sounding pies! Just a little section under “Special features”. Would that be so hard?!? But I digress. I don’t know much about making pies, but cakes? That’s another story! I’m a sucker for lime. You offer me lime-flavored anything and I’m there. And for me, when I think of limes, I think of Key limes. 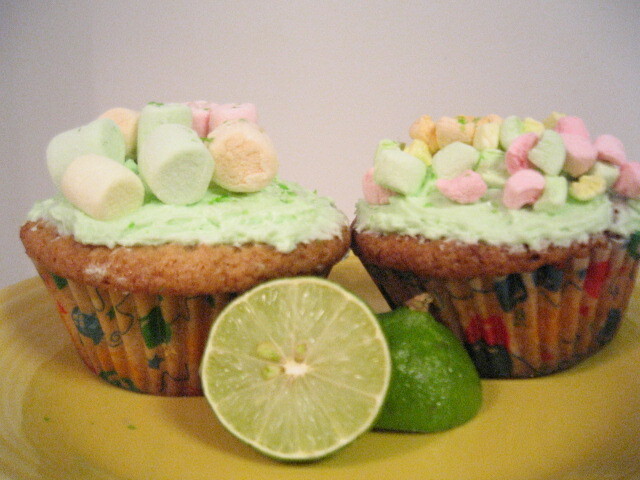 And when I think of Key limes I think of Florida and the ocean, so it was a natural progression for me to use key lime for my Marshmallow Mermaid cupcakes! 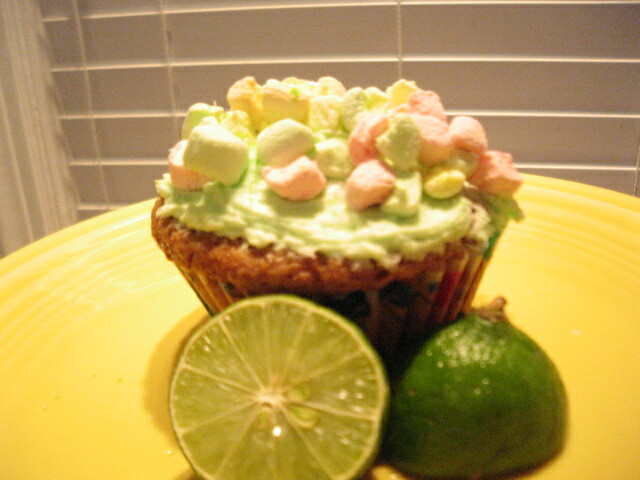 For this cupcake, I’m combining Key Lime Blondies, marshmallow frosting, mini multi-colored marshmallows and edible glitter. This is a new creation for me! I’ve never made any of the components before! Boldly into the fire I went! The first hurdle I ran into is the unavailability of key lime extract in my neck of the woods. But I persevered! 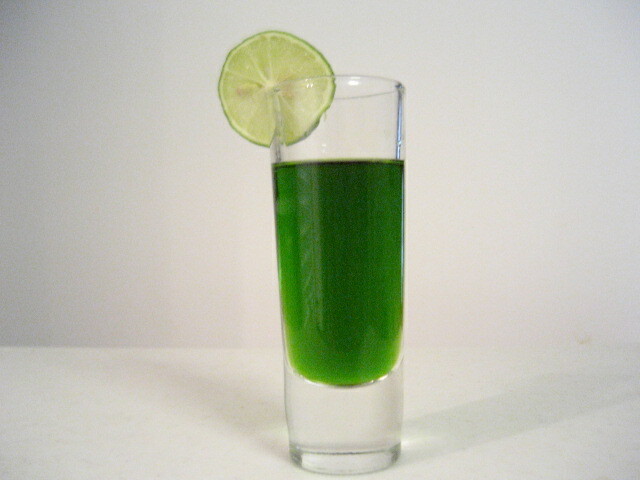 I found a lovely recipe on Recipezaar for Key Lime Extract. The straining process was rather long, but the end result was worth it. It came out such a gorgeous green! My next challenge was the Blondie base. Blondies/Brownies don’t rise as much as cake batter, so I had to decide how much batter to put in each cut to achieve “cupcake” height… I experimented with different levels (some were very sad little cupcakes. I had to put them out of their misery *yum*). I found ¾ of the way full was the way to go. The Blondie batter makes for a very flat cupcake. If I were topping these with just regular icing, it would have been disappointing, but since I’m covering it with mini mallows, it makes for a lovely, flat decorating surface. 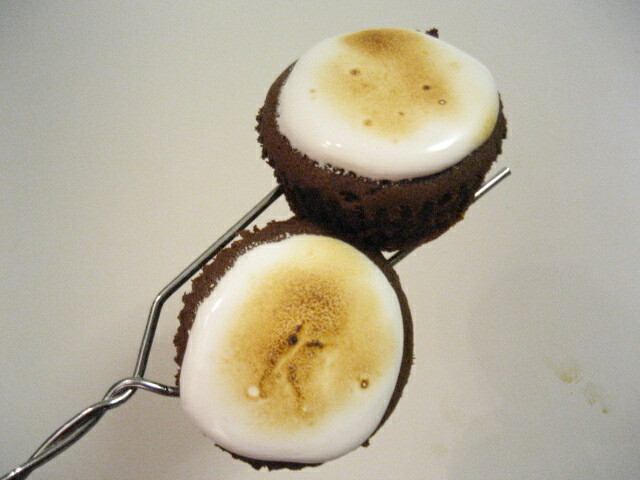 I decorated some with whole mallows and others I cut the mallows into 4 pieces. Which one do you like better? All in all I think this cupcake was a great success and a great learning experience. I always prefer to make things I’ve never made before. Keeps my kitchen interesting! Plus, if I actually ever get to open my bakery *sighs dreamily* I’ll have lots of inventions stored up! Preheat oven to 350°F. Line a few muffin pans with aluminum foil liners. Butter and flour foil. Whisk 2 cups flour, baking powder, salt, and baking soda in medium bowl to blend. Using an electric mixer beat the brown sugar and the butter, in large bowl, until light and fluffy. Beat in eggs 1 at a time, then key lime juice. Add flour mixture and beat just until blended. Stir in shredded coconut. Fill each baking cup ¾ full. Bake dessert until top is golden and tester inserted into center comes out clean, about 50 minutes. Cool completely in pan on rack. Makes 24 cupcakes. For the traditional Blondie, bake in a 9×9 pan, lined with foil that has been buttered and floured, and it will yield 16 Blondies. Top cooled cupcakes with marshmallow frosting, mini marshmallows (cut into 4ths or whole) and edible glitter. Enjoy! …makes me want to go on vacation somewhere sunny and warm. Well, fair readers, I’m sorry to say that my joining of Tuesdays with Dorie will have to be postponed a week. I was all set to make the lovely Russian Grandmothers’ Apple Pie-Cake on pages 310-311 but, alas, my plumbing wanted no part of it. In fact, it threw a full blown hissy fit! Backed up the shower, the sink, the dishwasher and even overflowed into the basement covering the washer with it’s fitful filth! I could not bring myself to bake in such a condition, seeing as once I baked I would be unable to wash… anything. So I persevere and live to bake another day! You’ve won this one, plumbing but I’ll not be foiled again! Well, this month’s DBC looked intimidating when we first saw it; we have to be honest. But once we read through it a few times and really had a chance to process the information, it’s really quite simple! It’s a lot of time, but not terribly difficult. We started around 2 pm and finished around 11 pm! And that’s with cutting our last rise short! Phew! When we make it again (and we will because it was SCRUMPTIOUS!) we’ll have to start in the morning to give it a proper 3rd rise. With the exception of the last rise, the only hiccup we had was that we forgot to brush the batards with water (we were bleary eyed by that time) so our bread was not particularly browned. It did have a lovely “thump” and the taste was just perfect. We chose to make 3 batards so we each took one home. That one loaf per house didn’t make it more that 24 hours anywhere! To our hosts for this month: we salute you for a spectactular choice! To our readers: it’s worth the time and happy baking! This is a long recipe, but persevere to the end! Stir the yeast in the 1/3 cup warm water and let liquefy completely while measuring flour into mixing bowl. When yeast has liquefied, pour it into the flour along with the salt and the rest of the water. Using the dough hook attachment on the speed the mixer manufacturer recommends for dough hook use or the lowest setting if there is no recommendation, slowly work all the ingredients together until a dough ball is formed, stopping the mixer and scrapping the bits of flour and chunks of dough off the bottom of the bowl and pressing them into the dough ball. Continue to mix the dough on a low speed until all the bits of flour and loose chunks of dough have formed a solid dough ball. Turn dough out onto kneading surface, scraping bowl clean. Dough will be soft and sticky. Let the dough rest for 2 – 3 minutes while you wash and dry the bowl (and the dough hook if using a stand mixer). Place dough back into the bowl and using the dough hook attachment at the recommended speed (low), knead the dough for about 5 – 7 minutes. At about the 5 minute mark, stop the mixer and push at the dough with your fingertips. If it springs back quickly, you have kneaded the dough enough. If it doesn’t spring back continue to knead, stopping the mixer and retesting every 2 minutes. If the dough sticks to your fingers, toss a sprinkling of flour onto the dough and continue to knead. 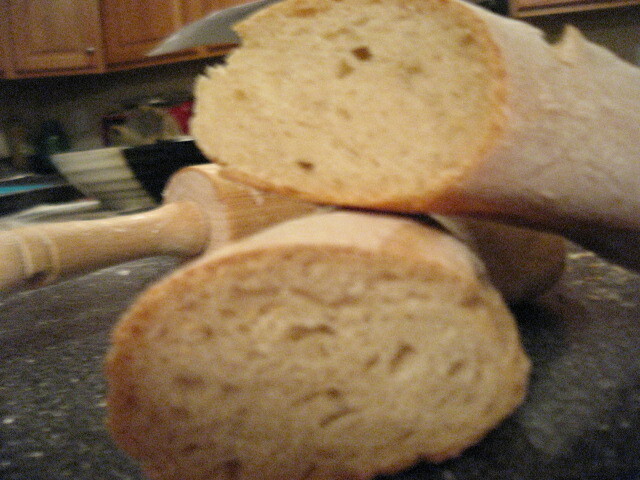 The dough should be light and springy when it is ready. Mary also recommends always finishing with about 1 – 2 minutes of hand kneading just to get a good feel for how the gluten is formed. Let dough rest for 3 – 4 minutes. Knead by hand for a minute. The surface should now look smooth; the dough will be less sticky but will still remain soft. It is now ready for its first rise. Slip the bowl into a large plastic bag or cover with plastic, and top with a folded bath towel. Set on a wooden surface; marble or stone are too cold. Or on a folded towel or pillow, and let rise free from drafts anyplace where the temperature is around 70°. If the room is too hot, set bowl in water and keep renewing water to maintain around 70°. Dough should take at least 3 – 4 hours to rise to 10 1/2 cups. If temperature is lower than 70°, it will simply take longer. If you making one large round loaf, you will not cut the dough at all and just need to follow the directions below. Preheat oven to 450° about 30 minutes before estimated baking time. Dough is now lying along one edge of the unmolding board: rest this edge on the right side of a lightly buttered baking sheet. Gently dislodge dough onto baking sheet, keeping same side of the dough uppermost: this is the soft smooth side, which was underneath while dough rose on canvas. 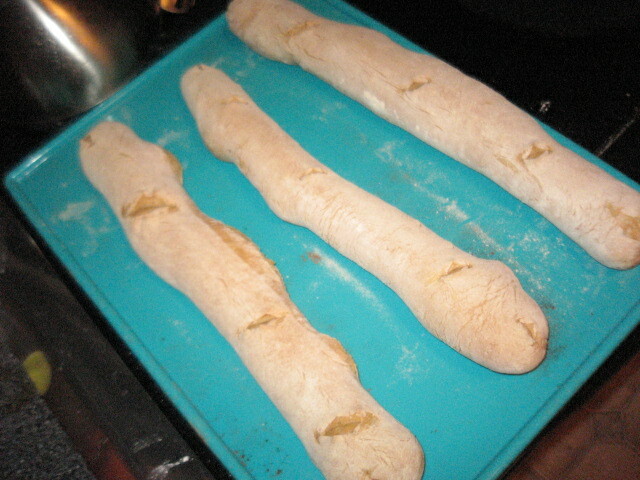 If necessary, run sides of hands lightly down the length of the dough to straighten it. Unmold the next piece of dough the same way, placing it to the left of the first, leaving a 3 inch space. Unmold the final piece near the left side of the sheet. You are currently browsing the KBK Bakery's Adventures in Baking! blog archives for March, 2008.